Pushpins can be a problem. But they are what they are, right? There’s no getting around them. 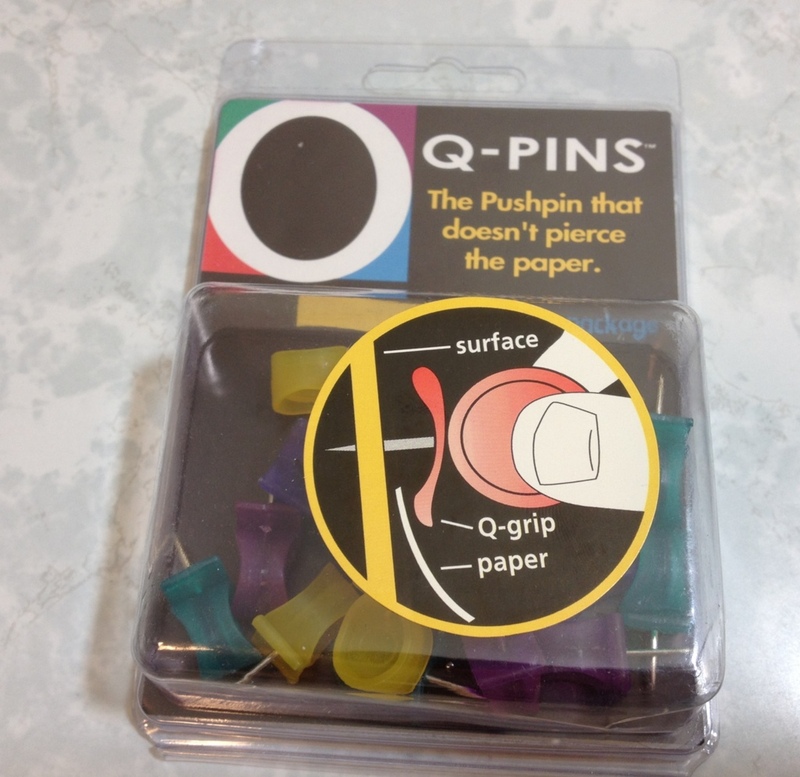 That’s what I would’ve thought until I heard about Q-Pins pushpins, which claim to have updated the pushpin to a more modern and easy-to-use design. How do they hold up? Full disclosure before I begin: I was sent these to review by the company. With that out of the way, let’s look at the features: Q-Pins are designed to deal with the problems one encounters when using regular pushpins. They’re shaped like a capital “Q” and use the tail to hold paper to the board, rather than the pin itself. If one doesn’t use the pin on a regular pushpin, the amount of force required to hold the document up will leave an unappealing mark. I used to get around this by using thumbtacks, which has less grip for your fingers, but more for the document. I’d best describe Q-pins as a cross between the best parts of a pushpin and thumbtack, with a little more ergonomics. The edges of the bowl on the Q are curved inwards, creating a nice grip for the thumb and index finger that is more than enough to get it out. They come in either packs of black and white opaque or a pack of green, blue, purple, and yellow translucent. Personally I wish there were more color sets, but these work well. 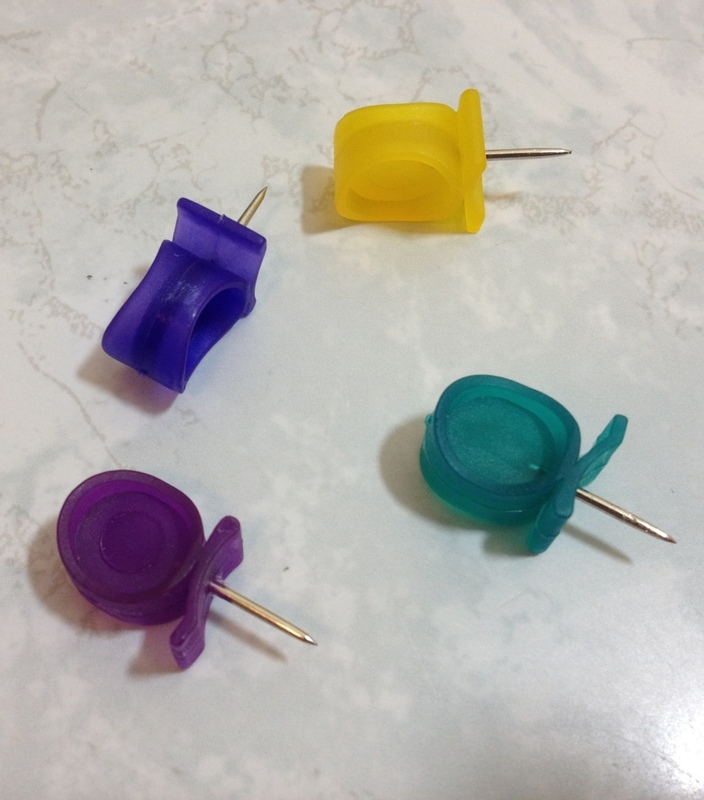 Now, it’s kinda hard to talk about what a pushpin does, even though I have done that quite a bit, it looks like. In any case, I decided to try and beat up a q-pin by throwing it across the room and at the floor with a moderate amount of force. The results were not a scratch, and I’ve seen pushpins shatter under similar conditions (though rarely). I tried bending the tail off, and my fingers began to hurt as the plastic started bending. I’m sure they can be broken, but it almost has to be intentional. And for a bit of fun, I grabbed the metal pin itself with pliers and pulled firmly in both directions. The pin and its plastic case are not easily separated. So, are they better than pushpins? Yes. Are they perfect? No. If one is very careful or hangs up thick documents, the pin can be used to hang an object without a mark. But sometimes even a natural amount of force can lead to a straight indent in the document being hung. This is certainly better than a hole, and in my opinion it’s also better than the circular indent coming from a pushpin or thumbtack used with friction. In this scenario, the Q-Pin also has superior holding capability, though it is quite close. Removing the Q-Pin is also much easier than either of the two other options. It’s a clear winner, but it is a bit more expensive. If you don’t lose things and want a better pushpin, possibly for life, you should try some Q-Pins. This entry was posted in Intermediate Supplies, Tools and tagged batter thumbtacks, better pins, better pushpins, document saving, how to save pinned documents, no holes, pinning documents, pinning up documents, pushpin, pushpins, q-pins, quality pushpins, review, thumbtacks by Dragon Co (Austin Smith). Bookmark the permalink.